Although Daisaku Ikeda could not attend meetings, he could go to Culture Festivals. In June 1981, he attended the first World Peace Culture Festival in Chicago. 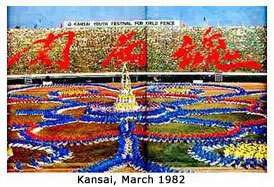 In March 1982, there was a Culture Festival in Kansai, then another one in April. Once of the most memorable of these early culture festivals was in Chubu in September 1982. It was pouring rain all day and Mr. Ikeda's concern was for the performers and spectators who had arrived at the stadium very early. Some of them had been drenched for hours, but the spirit was high. When he was asked to speak, he simply said, "Sorry for the delay. Please don't catch cold." It was unexpectedly short, but people later remarked how impressed they were with his concern for the participants. It was not the time for a grand speech, and Mr. Ikeda had grasped the true needs of the people. Over the next few years, Daisaku Ikeda went to many culture festivals. In 1984 and 1985, he attended almost one a week. He met over 200,000 youth at these festivals.